DMossEsq: That shouldn't be there, should it? That shouldn't be there, should it? They've stopped claiming falsely that GOV.UK replaces Directgov and Business Link? 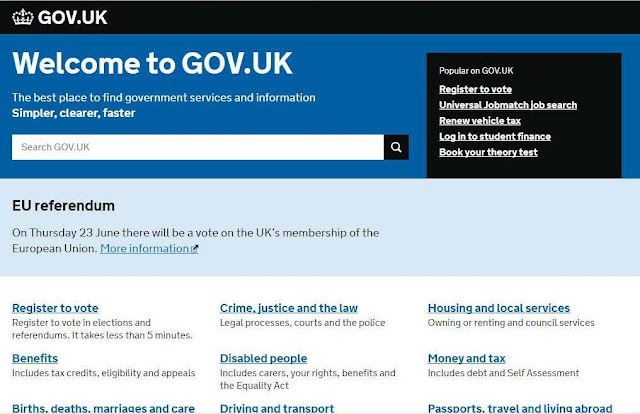 They're still claiming falsely that you can use GOV.UK to register to vote? They're suggesting falsely that Universal Jobmatch is a GOV.UK service when in fact it's still on Directgov? What about that quite large reference to the EU referendum which occupies a not inconsiderable amount of the prime acreage on the screen? And the link to Find out why the Government believes we should remain. Oh yes. Bit odd. That shouldn't be there, should it? RIP IDA – are GDS talking to themselves? "Where we’re at, and where we’re going"